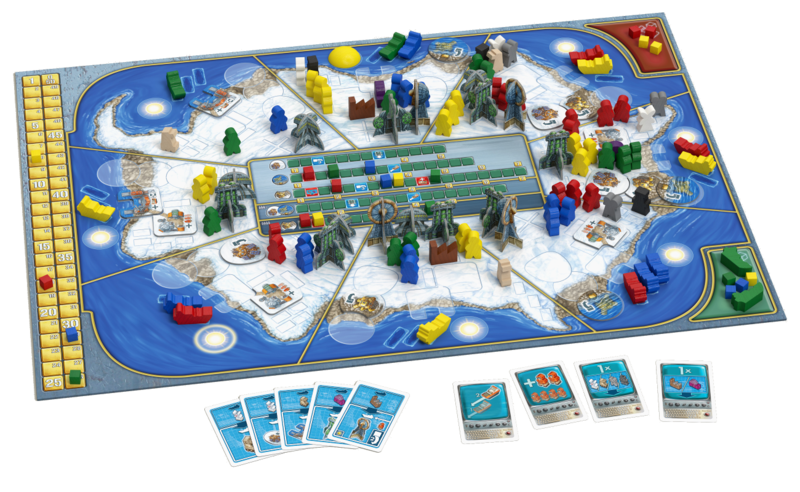 As the sun orbits around Antarctica your team of scientists and ships struggle to set-up research outpost and other equipment before your opponents. Each building also has some requirements – other buildings – and you need to have your other ships at an area where those buildings are present to build the new building. At the start of the game this is simple enough since there won’t be that many buildings on the board, but as the game goes by more and more buildings will “clutter” up the board. Turn order is determined in a very unique way, by a sun piece moving counter-clockwise each turn. The player who has the first ship in that areas queue will then get to move that ship to a new area and will get to either build a new building there or do other actions. Building buildings allows the player to place the scientists that are in their current supply (players also have additional scientists in a “reserve” that they need to spend actions to get into their “supply”). 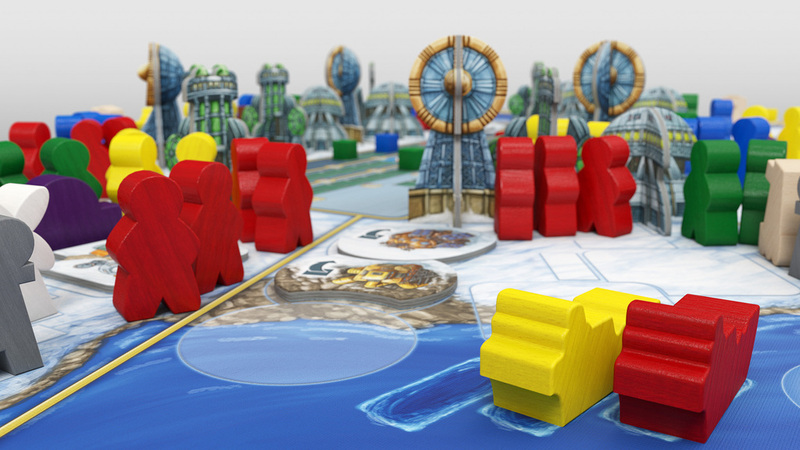 The game ends when one player has all his or her scientists on the board, or the last building is build. At that point the players receive points for controlling scientists and ships at the eight different locations. If you have the most combined ships and scientists there you get points equal to the total number of scientists and ships for all players in that area. If you have the second most you only get points equal to the first players ships and scientists, third player get’s what the second player has and so on. So having majority in an area with lots of other players meeples will score you a lot of points. In addition to this there are also several research tracks on the center of the gameboard, that are scored the same kind way based on the players position on them. Antarctica has a lot of good things going for it. It’s innovative and clever movement of the sun and the ships, and it’s point scoring are both great. But it also has some down sides. At the end of the game it get’s very hard to see what is where. The board will get cluttered with meeples, tokens and wooden buildings. This clutter while also a problem for me visually, hampers the play since you need to look at the board to figure out where you want to build what and where you have access to the right buildings. I wouldn’t say the game isn’t fun. But on the other hand I wouldn’t say it is fun. People who like the interesting scoring and sitting and thinking about their next move will most likely find it a lot more fun than I have. While the mechanics in the game are interesting, I don’t feel they connect to the theme of the game at all. Thinking about them it makes very little sense in regards to theme. Why would the sun dictate the turn order? Why do you need your other ships at other locations to have access to the resources? While the art on the cards and the board by themselves are fine I feel that the overall combined look is a bit muddled. Having a mix of wooden buildings, 3D card board and flat tokens makes the visual experience of the game seem unfinished to me. The rulebook isn’t long but doesn’t do a great job at explaining the rules in a good way, but the overall component quality of the gameboard, cards and meeples is pretty good. While the actions you can take in the game are relatively simple once you know what they are, the innovative way the movement of the ships work and the scoring makes the game more complex than an average comparable game. This complexity is however quickly overcome after a few plays.